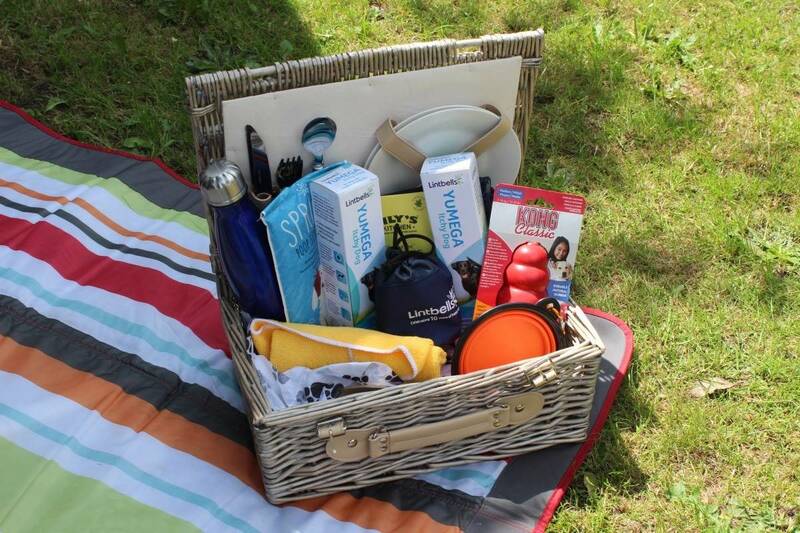 At this time of year so many people feel the effects of hayfever and other allergies, especially when they are out of the house. But, it’s not just people who experience it – allergies can affect dogs too, with them itching constantly because of it! 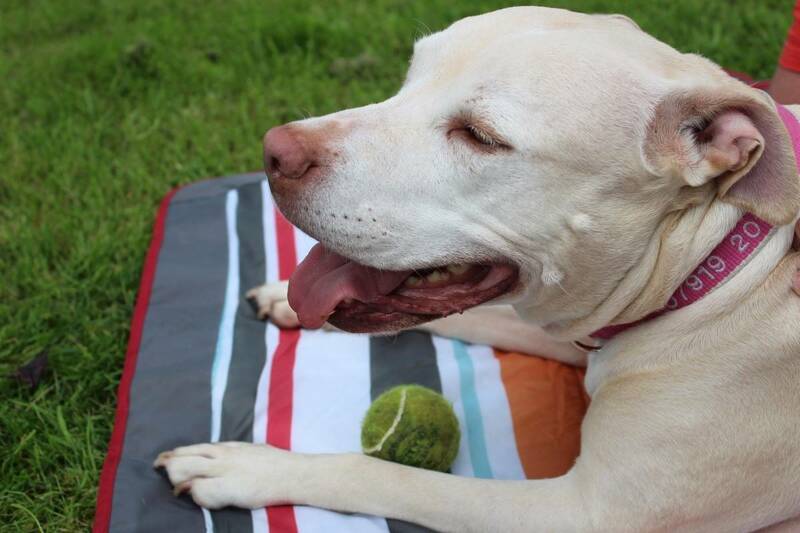 So many dogs experience flare ups in the summer – and lots of dogs have a poor barrier function – making their skin more vulnerable to irritants and allergens. I know from experience that our family dog, Jasmine, gets itchy from running through long grass and the more she itches the more itchy her skin becomes and it’s hard to know how to make things easier for her at this time of year. But dogs can be allergic to not just grass and tree pollens but also dust mites and flea dirt – meaning that good flea protection is essential for dogs with itchy skin. But, you can’t really keep a dog away from grass and the great outdoors can you? – dogs just love to run, play fetch and be outside – so what can you do? 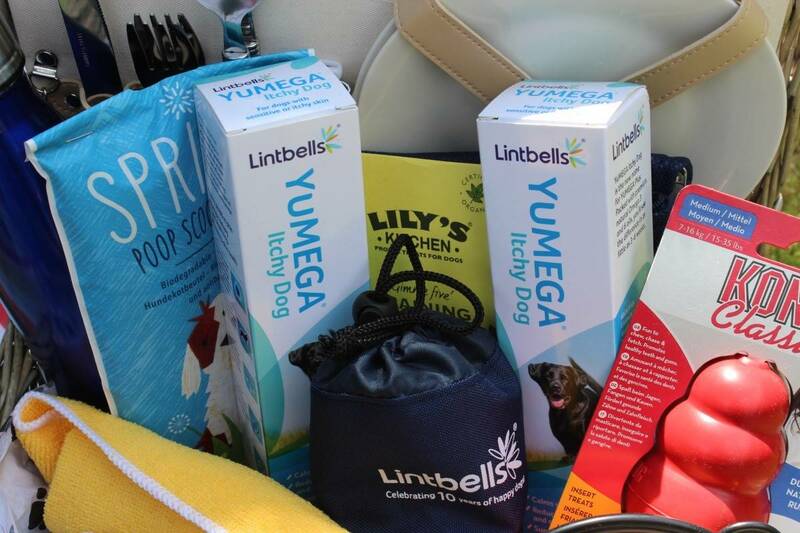 Well Lintbells, makers of YuMEGA Itchy Dog, sent us a hamper of their YuMEGA Itchy Dog product and other gifts to help both Jasmine and her family get outside and enjoy more of the summer months. The hamper included a pack of dog snacks, a portable water bowl for Jasmine and a water bottle for us, a dog toy, biodegradable poop scoop bags and a microfiber cloth to prepare us for irritations and itches, letting us give Jasmine a wipe down whenever she needs one. There was also plenty of YuMEGA Itchy Dog to keep Jasmine itch-free all summer long. It contains a mix of omega oil, Golden Flax, Starflower oil and Salmon oil which help to soothe itching and calm sensitive skin. 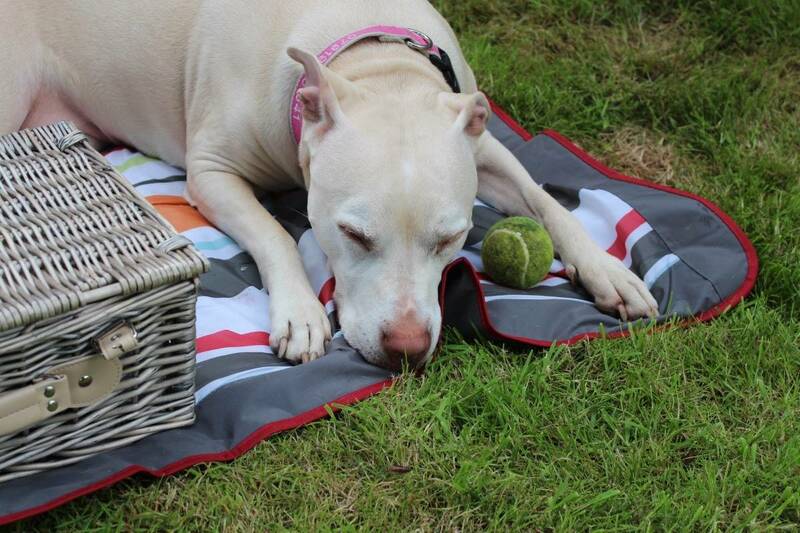 We are now planning on taking Jasmine with us for plenty of picnics – or Pupnics! 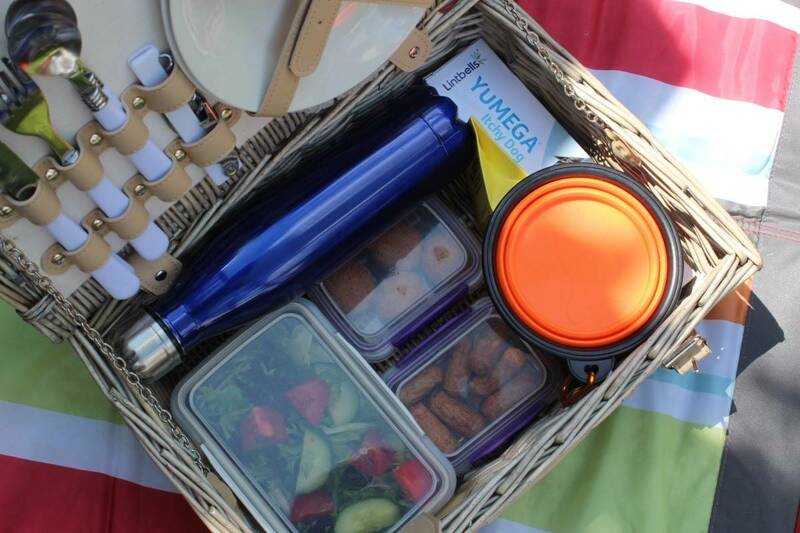 Picnics are a great way of walking the dog but with more purpose, combining it with seeing new places and really just having a slower pace of life. Do make an appointment to see your vet if your dog has an itch – broken skin can become infected with bacteria, yeasts or fungi and the more your dog scratches the more damage they can do. Do wipe your dog down your dog using the microfiber cloth after they have been outdoors to reduce exposure to allergens that have attached to the coat. Do talk to your vet about regular flea treatment – many skin problems are associated with fleas and they may not always be visible as they can jump on and off your dog. 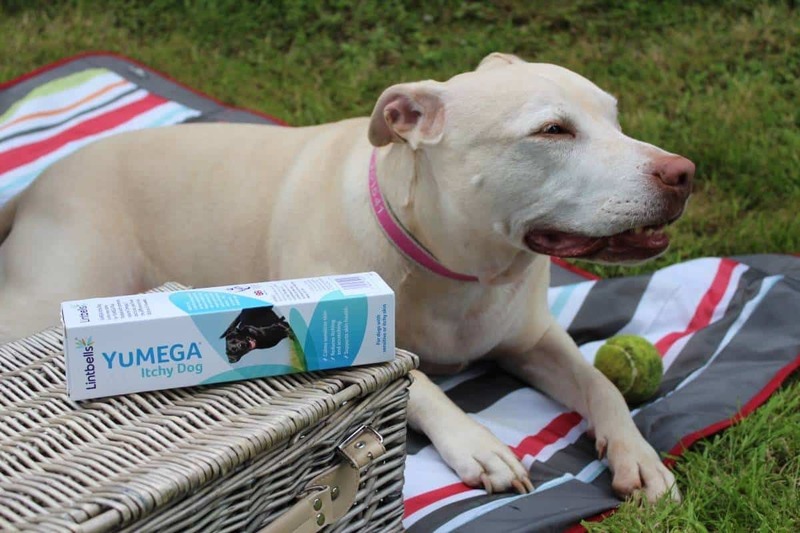 Do feed a good quality diet but be aware that some omega oils are easily damaged during processing and storage of food and giving a high quality supplement such as YuMEGA Itchy Dog is the only reliable way to ensure you give enough. Dogs can experience allergies to inhaled substances like dust mites indoors and pollens outdoors and some are sensitive to certain foods. Do talk to your vet if you think your dog could have a food allergy – it’s not enough to switch flavours, varieties or even brands. Some dogs with food allergies get itchy ears and no other signs. Do not ignore the problem hoping it will get better – sometimes dogs can be allergic to one allergen but eventually become allergic to multiple allergens and seasonal allergies can eventually become year round problems. Do keep an itch diary – recording when the itch got worse and anything that happened around that time. Do bath your itchy dog frequently with a good quality dog shampoo recommended by your vet to help remove allergens from your dog’s coat. Don’t use human shampoos on your dog as they are formulated for human skin which has a different level of acidity compared to dog’s skin. Do wash bedding using soap flakes rather than washing powder. Washing at high temperatures also removes dust mites. Toys that can’t be washed can be popped in the freezer in a plastic bag to kill off dust mites. Check the ingredients in your dog’s food . One of the most common causes of itchy skin are food allergies. Ingredients to watch out for include corn wheat or soy which are common allergy triggers. Our chihuahua has food allergies, and since switching to Orijen, a natural food, her itching has stopped! I always wipe my dog down after he’s been outside….you never know what they could be allergic too. My vet is definitely my first port of call if itching is severe. Regular flee treatment and a good healthy diet. This post makes me want a dog! Your list is brilliant, pretty much covers everything I reckon? I think it’s more important than ever in the summertime to brush your dog down and to check his coat and paws for irritants…especially those nasty seeds that can get stuck in the skin and develop into bigger problems later on. I think it is a case of shampoo and check for nasties regularly. Regular flea treatments and always read the food label ingredients. i believe in a healthy diet, and grooming, we make sure our dog goes to the groomers regularly. My poor border collie Skye has terrible seasonal allergies. She does react to vegetation my best best tip is to look at their diet, as Skye improved a lot when we switched her to grain free Lily’s Kitchen. Brush that cost through, my collie gets terribly itchy when his winter coat hasn’t been brushed out! It is difficult to know what exactly helps because when I see my dogs in distress I try to do everything and anything to help but an oatmeal bath seems to help. I stick some rolled oats in a food processor and blitz them, put them in a cloth and tie over the tap as I run a lukewarm bath. Could do without temperatures in the 30s too! I too think keeping an eye on a healthy diet is key. Regular bathing and grooming, especially after being in long grass. I always keep my dog brushes to stop her overheating and wipe her with a cold damp flannel if she looks hot. I also pop her bed pillow into a carrier bag and place it in the freezer to chill it and she loves the cold feeling when it goes back! Good grooming and a good dog shampoo. Regular flea treatments. I believe that coconut oil soothes them as well. flee treatment and a good diet. Don’t over bath your dog as it can lead to itchy irritated skin. Make sure when you bath them to rinse completely. Nothing itches like shampoo not completely rinsed off. A healthy diet and regular flea treatments. I would say my best tip for treating itchy dogs is to treat both them and the environment for fleas, as that’s the most common cause even if there are no apparent signs! A towel rub is sometimes helpful to relive itching skin. Regular vet visit and grooming. Keep them cool and avoid the long grasses. My tip is grooming them every day even twice a day and checking their fur all the time. I’ve no idea as yet! My puppy is 16 weeks old. First dog I have ever had. I treat her for fleas regularly so I don’t think it is that, but we live beside woods and the beach and walk there every day. She gets so itchy and I’m not sure what is causing it. I try to bathe her regularly with hypo allergenic dog shampoo and try to take her mind off of the itch when she is scratching so she doesn’t cause damage. I never thought of wiping her with a cloth after being out I will certainly try that too. Keeping them groomed so they don’t get too much oil build up on their skin which can cause unnecessary itching. I’m in the coconut oil camp. We use it on all our animals. Dog shampoo made with natural ingredients, and regular brushing. According to our Vet, dogs can take Piriton so buy this as it is cheaper than getting a prescription from the vet. I have a Lhasa apso & a Shih tzu who both have very sensitive skin so I try and feed them a healthy diet with very little red meat because that seems to set them off.